One of our local High Street shops is going the extra mile for the Christmas season. Whilst most shops will close for Christmas on Saturday 23rd December, Phil Nicodemi and his team at The Lovington Bakery, Market Place, will also be open for business on Christmas Eve (Sunday 24th) between 8am and 12 noon. Since opening in Wincanton, the bakery has attracted more and more customers for their Italian style breads, pastries, and pizzas. The Lovington café has also become a very popular venue for social gatherings. 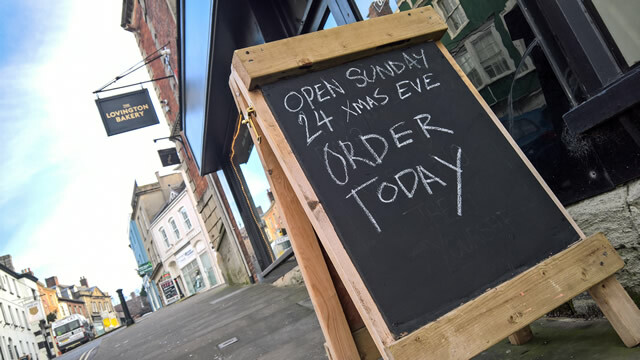 On Sunday, the shop shelves will be fully stocked as normal, but with the Christmas season creating extra demand, he advises pre-ordering to ensure that you get what you need. Orders can be collected up to 12 noon on Christmas Eve. After Christmas, the shop will next open for business on Saturday 30th December between 8am and 4pm to allow purchases to cover the New Year period. The shop will be closed New Year’s Eve and New Year’s Day, opening for business as usual on Tuesday 2nd January 2018.